President Benigno S. Aquino III signed into law Republic Act No. 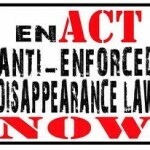 10350 or the Anti-Enforced or Involuntary Disappearance Act of 2012. Security forces involved in such offenses can be arrested and charged. It also includes non-exemption of any offender from amnesty, either convicted or facing prosecution, from liability. The Human Rights Watch (HRW), lauded President Benigno S. Aquino III and the Congress for the passage of the law which is the first of its kind in Asia and a major milestone in ending human rights violations in the Philippines. Most notable cases of enforced or involuntary disappearances include the abductions of Jonas Burgos, Sherlyn Cadapan and Karen Empeno as well as other desaparecidos. The new law provides compensation, restitution and rehabilitation for the victims of the crime. Under the law, superior officers who order or are otherwise implicated in a disappearance face the same penalty as those who directly carried out the crime. Subordinates could now defy unlawful orders of superiors for the commission of enforced disappearances. It also calls for periodic update of registry of all detained persons in detention centers, and the law prohibits existence of secret detention facilities. The salient features of the law is the government cannot suspend the law even in times of war or public emergency. The severest penalty for violators of the Anti-Enforced or Involuntary Disappearance Act of 2012 will be reclusion perpetua or life imprisonment. The government vowed to effectively enforce the law in a bid to deter enforced disappearances and address the problem of human rights violations, Presidential Spokesperson Edwin Lacierda said.